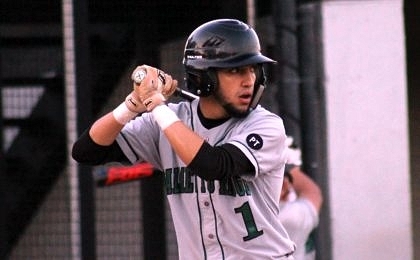 Adrian Soler drove in all three runs for Palmetto Ridge. When Archbishop McCarthy manager Aaron Vorachek went to the bullpen late in the fifth inning for reliever Daniel Diaz, there was no intention of that being the last call to the pen on the night. But the way the junior left-hander pitched worked to change his manager’s mind. Diaz held off a late rally bid to keep his club in the lead, and Archbishop McCarthy held on for a 6-3 victory over Palmetto Ridge on Wednesday night. Diaz came on with two outs and runners on the corners with his club up by a pair of runs. The southpaw got a line out deep to right field to end that threat, and went on to put up two more scoreless frames to earn the save. Although Diaz was able to quiet the Bears’ final rally bid, Palmetto Ridge manager Kyle Mason was pleased with the strong finish that helped offset a bumpy start. Diaz preserved the win for starter Daniel Paret, who picked up the win with three solid innings. The left-hander allowed two earned runs on three hits and recorded four strikeouts. Junior Eric Lewis was the first arm out of the bullpen, and the right-hander continued to be an asset to his club however they need him. Lewis recorded five valuable outs while allowing an unearned run on a hit and a walk. With runners on the corners and a left-handed hitter coming to the plate, the original plan had been to get at least one key out from Diaz. Cristian Torres singles in the third inning. Coach Vorachek’s offensive approach is a fast-paced and aggressive style, and the Mavericks (4-3) managed exactly that right out of the chutes for all the runs they ultimately needed. McCarthy batted around the order to put five runs on the board, as the first five batters all reached base safely. Falling behind early on is never good for any team, and it was the scenario the Bears were looking to avoid right now with an offense that has been inconsistent of late. Yet the result of that was the offense put together some quality at bats to get the team back in the game and prove they are never out of the fight. 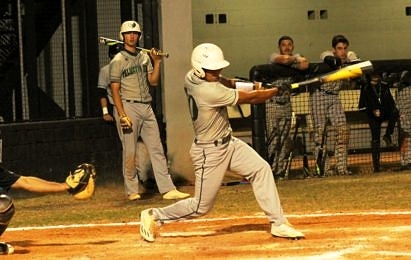 Palmetto Ridge (4-3) got on the scoreboard to make a game of it with a pair of runs in the third. Cristian Torres lined a two-out single to center and starting pitcher Derek Rascher followed with a base knock of his own, before giving way to courtesy-runner Alejandro Cordoves. Adrian Soler then delivered with a single to center field that drove in both base runners to make it a 5-2 ball game. The Bears got it going again in the fifth. Noah White bounced a single past the diving shortstop but was then erased at second on a fielder’s choice from Torres. Rascher then reached on an infield error that put runners on the corners, and Soler delivered again by lifting a shot to center field for a sac-fly RBI.